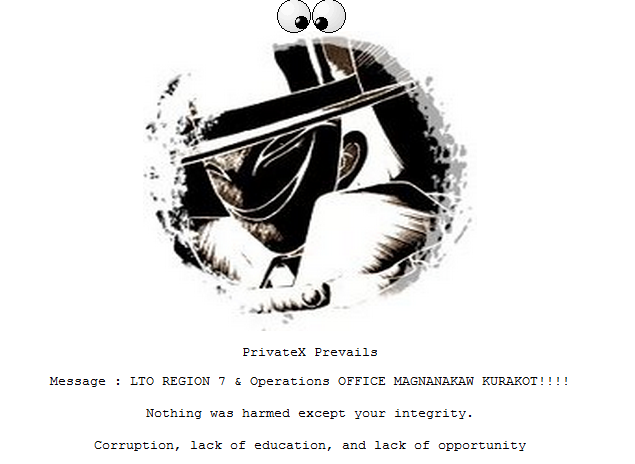 PrivateX hackers defaced the website of the Philippine Nuclear Research Institute (PNRI) and left a message accusing another government agency of corruption. The "PrivateX" group redirected visitors to the PNRI website to a custom Pastehtml page featuring its logo. PNRI website was hacked to support President Benigno Aquino III and his State of the Nation Address (SONA). Message : LTO REGION 7 & Operations OFFICE MAGNANAKAW KURAKOT (Land Transportation Office Region 7 and Operations Office, thieves)!!!!" it said in its latest cyberattack.Nothing was harmed except your integrity... Corruption, lack of education, and lack of opportunity.